'Don't Be Shy' OGB- ( Sharon McAllister, R. 1994). Seedling 89-12-6. AB, 29" (74 cm), Early midseason bloom. Standards grayed greenish yellow; Fals grayed greenish yellow with a network of burgundy and rust lines radiating from near-black beards; burgundy signal. 'Casa Vicente' X 'Joint Venture'. Sibling to 'At Last' and 'Simply Luscious'. 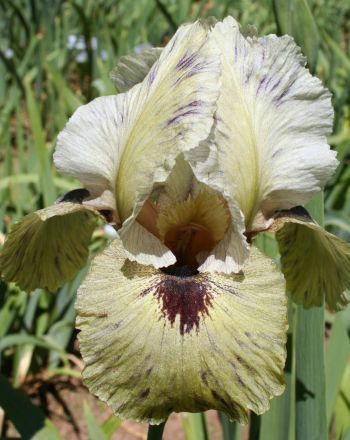 McAllister's Iris Garden, 1994.